Here in North Texas, people love their lawns. One of the most popular turf choices is St. Augustine. You’ll love it for its thick, carpet-like feel, emerald green color and slight shade tolerance. We suggest laying new sod in fall as it is much easier to establish new turf through fall and winter. 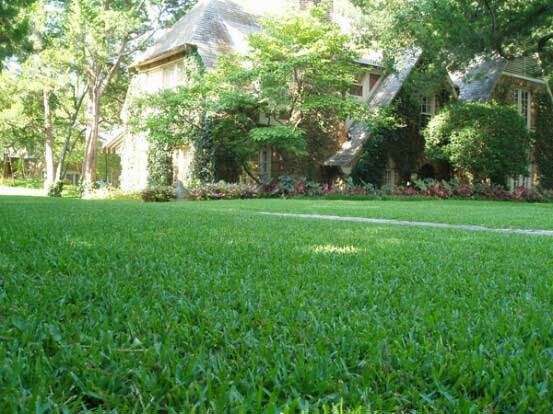 Summer heat and drought make it very difficult to establish a new lawn. How much should I water my established St. Augustine lawn? Established St. Augustine lawns will thrive with the equivalent of one inch of rainfall per week, preferably in the morning. Watering overnight causes your lawn to be more susceptible to fungal diseases. If you live in an area where water restrictions only allow watering every other week, then water your lawn twice on your allowed day: Once in the morning and once in the early evening. Remember that watering for short periods of time damages your lawn by encouraging a weak, shallow root system. Your goal should be to deliver a deep watering all in one day. Learn more about proper watering here. Mow properly. Typically, you’ll start mowing in early spring after the lawn has greened up and stop in early winter when it begins to go dormant. Never mow off more than one-third of the leaf blade and leave those clippings on the lawn. Rake them evenly after mowing to mulch into the soil. The merits of proper mowing here. Feed your lawn at the right time. Our Soil Building Program members receive the proper feedings year round. If you are feeding your lawn on your own, we recommend a March, June and September fertilization. St. Augustine needs sun! 6-hours of sun is best to grow lush and vigorous grass. If your lawn is struggling under that beautiful oak tree, it is probably in too much shade. Details on a few alternatives to plant under shade trees here. Weeds: St. Augustine is typically one of the better grasses when it comes to out-competing weeds. Its large leaf blades do a good job of shading out weed seedlings. Overseeding: St. Augustine does not tolerate overseeding with cool season grasses such as fescue and rye. Overseeding is not recommended. What to look out for: St. Augustine lawns are susceptible to chinch bugs and take-all root rot disease. Healthy soil and proper watering will keep roots strong so they can better withstand fungal diseases and pests. Join us on Twitter or Facebook to keep up-to-date on all the most current organic lawn and landscape tips! My St. Augustine behaves exactly as you describe! And I have a huge oak in the front, so the grass stays a little thin under the tree. Is there a suggested way to “thicken” it where it it mostly shaded? Or is that simply not possible? Thanks for all you do for our lawn! Hi Trey – Sorry to say that if you have shade, the grass will always thin. No amount of water/fertilizer will change that. It simply needs more direct sunlight in order to thrive. It may be that in the areas where it is thinning, you could transition to groundcover. Let us know if you need suggestions!